A cutdown version of the full-on Micro Q, the Phoenix has a charm all of its own. A bossy, quirky little synthesizer from Waldorf - if you can find one, give it a try. Individual sound. Most of a Q for much less cash. A design classic of tomorrow. The 'hard' sound won't be for everyone. Red text on the front panel is hard to read. Only 500 of these 'Phoenix' editions will be made. 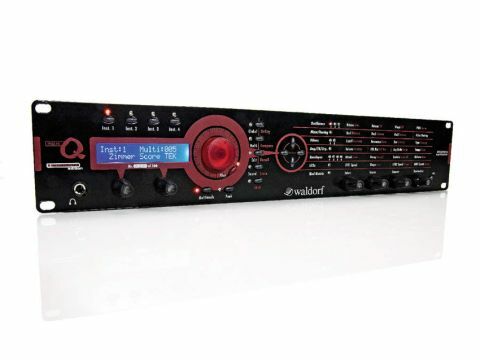 The Waldorf Q synthesizer has developed a keen following. For those happy to compromise on a couple of features however, there's the limited-edition (only 500 have been made) Micro-Q in Waldorf's 'Phoenix' styling. The Micro Q is a 16-part multi-timbral synth that's capable of 25-voice polyphony. It contains 300 preset programs, a multimode with 100 presets, plus 20 separate maps for its (very good) drum sounds. Editing takes place on the front panel, with a matrix printed thereupon through which you can navigate to set up the real-time controllers of your choice. The unit is a tremendously slim 2U rack-mountable module that features no fewer than three sets of stereo line outs alongside a trio of MIDI ports and a stereo pair of line ins. The latter enable you to route a signal into the Micro Q for sound processing and double as the signal inlet for the onboard vocoder. The sound engine is impressively spec'd too, with up to five oscillators assignable to a single voice. Alongside the more common synth waveforms you'll find two wavetables with 128 waves each, so it's no surprise to discover that stepped and evolving sounds are a Micro-Q forte. Specs aside, synths are judged on the sound they produce, yet finding the right words to describe the Micro Q's isn't easy. 'Hard' would be a useful starting point, with many sounds here possessing killer attack and power. 'Metallic' might be another, as the Micro Q is effortlessly capable of industrial, clanging tones too. 'Cold' might seem unfair but this isn't necessarily a criticism. While most synths tend to take the edge off any such tendencies, the Micro Q wears this quality like a badge of honour, keeping the majority of its presets free of warm reverb or friendly delays. Indeed, this is a synth engine that sounds like few others, and Waldorf should be congratulated for making it so. It's certainly true that this little box produces sounds that will cut through any mix, and while the sounds won't be to everyone's taste, they certainly makes a strong impression. There's no doubt about it - this is a synthesizer that has personality in spades. Of particular note is a fantastic set of electronic drum sounds. There's a lot here - including the predictable 808 and 909 emulations - but these are far less interesting than the spectacular capabilities of the Q's own drum and percussion voices. Too many synths seem to have drums added as an afterthought, but with a great range of tones and the opportunity to organise these into up to 20 dedicated drum maps, this is an engine to rival some dedicated electronic drum modules. Editing sounds, drums or otherwise, takes place on the front panel matrix, which is pretty straightforward. Rows of parameters are organised into categories for the oscillators, filters, envelopes and the LFOs, with eight functions assigned to each. These are accessed via four endless rotary dials beneath each function group, with the Shift button enabling access to the 'second' function per dial. Much as we like the Phoenix styling, the fact that these secondary functions are printed in dark red on black means that they're not the easiest to make out. However, arrowing around the matrix is very easy, with bright red LEDs keeping you in touch with your current location. One thing we really like is that, in categories where you'd expect to be able to 'group edit', Waldorf has made this possible. For example, you can edit either Filter 1 or 2, or both together. The LCD screen keeps you in touch with anything being edited so, again, settings for multiple objects are displayed if appropriate. Let's face it, it's probably never been harder to launch a hardware synthesizer into the marketplace. Sounds are available in so many places these days that any new product will have a hard time competing for your attention. But if punters made purchases based exclusively on the basis of individuality and power, the Micro Q would sell many more units than its fixed run of 500 will limit it to. The sound is big, industrial, clank and dominating, and it will easily shred the noises offered by less physical synthesizer specimens. It's guaranteed to make an impact and, sadly, this isn't something that can be said of every synth release. It won't suit everyone, but if you're looking for something a little unusual but that packs a serious punch, join the Micro Q(ueue).